In the mood for a restful afternoon's stroll? Then savour the verdant charms of the Back Walk, which loops around much of the Old Town, following the line of the Medieval defensive Burgh Wall which - as our bloody history proves - never really succeeded in keeping would-be invaders out! Much of the Wall was demolished in the 18th-century, and it quickly became one of our very first visitor attractions. 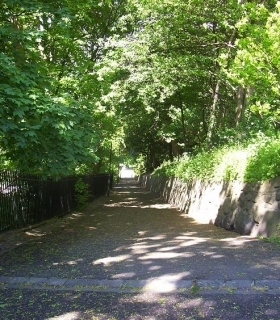 From Dumbarton Road, and the site of the original Burgh Gate, the Back Walk continues uphill, skirting the Stirling Highland Hotel (the Victorian High School, famed for it's Observatory), the Erskine Marykirk, Old Town Jail, Cowane's Hospital and Holy Rude Cemeteries...before leading you into the majestic shadow of Stirling Castle, then across the Ballengeich Road toward the Gowan Hill, where the murderers of James I were beheaded in the 15th-century (the Beheading Stone is still there - having been rescued from a Forthside farmer who was using it to de-horn rams, in the 1880s). From this pretty, verdant pathwayway you can enjoy views, too, of the King's Park - the hunting grounds of the Stuart Kings - the Albert Halls and Smith Art Gallery & Museum, and the curious raised grassy mound of the King's Knot...and (on a clear day) the distant peak of Ben Lomond.